Nasal septum deviation or deviated nasal septum (DNS) is a physical disorder of the nose, involving a displacement of the nasal septum. Some displacement is common, affecting 80% of people, most unknowingly. Only more severe cases of a deviated septum will cause symptoms of difficulty breathing and require treatment. Symptoms of a deviated septum include infections of the sinus and sleep apnea, snoring, repetitive sneezing, facial pain, nosebleeds, difficulty with breathing, and mild to severe loss of the ability to smell. It is common for nasal septa to depart from the exact centerline; the septum is only considered deviated if the shift is substantial or is adversely affecting the patient. Many people with a deviation are unaware they have it until some pain is produced. By itself, a deviated septum can go undetected for years and thus be without any need for correction. In mild cases, symptoms can simply be treated with medications such as decongestants, antihistamines, and nasal spray. Medication temporarily relieves symptoms, but does not correct the underlying condition. Non-medical relief can also be obtained using nasal strips. A cure to symptoms related to septal deviations is available in the form of a minor surgical procedure known as a septoplasty. The surgery is performed quickly (lasts roughly 1 hour) and does not result in any cosmetic alteration or external scars. Recovery from the procedure may take anywhere from 2 days to 4 weeks to heal completely. Septal bones never regrow. However, if symptoms reappear they are not related to deviations. Reappearance of symptoms may be due to mucosal metaplasia of the nose. 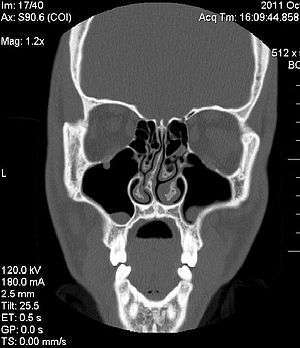 Nasal septum perforation due to bilateral trauma of the mucoperichondrial flaps opposite each other. Septal haematoma and septal abscess. Adhesions and synachiae between septal mucosa and lateral nasal wall. Saddle nose due to over-resection of the dorsal wall of the septal cartilage. Dropped nasal tip due to resection of the caudal margin. ↑ "Deviated Septum Surgery". Robert Kotler, MD, FACS. Retrieved 14 January 2012. ↑ Finkbohner R, Johnston D, Crawford ES, Coselli J, Milewicz DM (February 1995). "Marfan syndrome. Long-term survival and complications after aortic aneurysm repair". Circulation. 91 (3): 728–33. doi:10.1161/01.CIR.91.3.728. PMID 7828300. ↑ Bravo, MD, Jaime F (22 December 2011). "DIAGNOSTIC CRITERIA FOR JOINT". Retrieved 14 January 2012. Wikimedia Commons has media related to Nasal septum deviation.